This year, the FIA Formula One World Championship is set for a raft of radical technical regulation changes. From 2014 onwards, the cars will be powered by avant-garde powertrain technology, with a powerful turbocharged internal combustion engine coupled to sophisticated energy recovery systems. Power output will be boosted to levels not seen in the sport in over five years, however, two types of energy will propel the cars. The internal combustion engine will produce power through consumption of traditional carbon-based fuel, while electrical energy will be harvested from exhaust and braking by two motor generator units. The two systems will work in harmony, with teams and drivers balancing the use of the two types of energy throughout the race. Renault is fully prepared for this technical revolution, with its Energy F1-2014 Power Unit designed and developed at its Viry-Châtillon HQ in France ready for track testing. V6 is shorthand for an internal combustion engine with its cylinders arranged in two banks of 3 cylinders arranged in a 'V' configuration over a common crankshaft. The Renault Energy F1 V6 has a displacement of 1.6 litres and will make around 600bhp, or more than three times the power of a Clio RS. Contrary to popular belief, the ICE is not the easiest part of the Power Unit to design as the architecture is very different to the incumbent V8s. 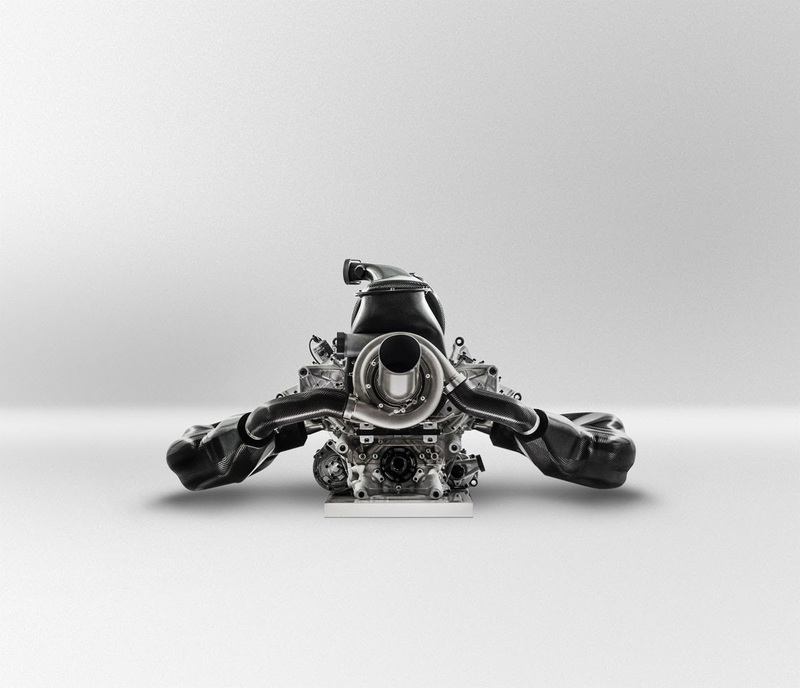 On account of the turbocharger the pressures within the combustion chamber are enormous – almost twice as much as the V8. The crankshaft and pistons will be subject to massive stresses and the pressure within the combustion chamber may rise to 200bar, or over 200 times ambient pressure. The pressure generated by the turbocharger may produce a 'knocking' within the combustion chamber that is very difficult to control or predict. Should this destructive phenomenon occur, the engine will be destroyed immediately. All Power Units must have direct fuel injection (DI), where fuel is sprayed directly into the combustion chamber rather than into the inlet port upstream of the inlet valves. The fuel-air mixture is formed within the cylinder, so great precision is required in metering and directing the fuel from the injector nozzle. This is a key sub-system at the heart of the fuel efficiency and power delivery of the power unit. One of the central design choices of the ICE was whether to make the DI top mounted (where the fuel is sprayed at the top of the combustion chamber close to the spark plug) or side mounted (lower down the chamber). The option still remains to cut cylinders to improve efficiency and driveability through corners. A turbocharger uses exhaust gas energy to increase the density of the engine intake air and therefore produce more power. Similar to the principle employed on roadcars, the turbocharger allows a smaller engine to make much more power than its size would normally permit. The exhaust energy is converted to mechanical shaft power by an exhaust turbine. The mechanical power from the turbine is then used to drive the compressor, and also the MGU-H (see below). At its fastest point the turbocharger is rotating at 100,000 revolutions per minute, or over 1,500 times per second, so the pressures and temperatures generated will be enormous. Some of the energy recovered from the exhaust will be passed on to the MGU-H and converted to electrical energy that will be stored and can later be re-deployed to prevent the turbo slowing too much under braking. As the turbocharger speed must vary to match the requirement of the engine, there may be a delay in torque response, known as turbo lag, when the driver gets on the throttle after a period of sustained braking. One of the great challenges of the new power unit is to reduce this to near zero to match the instant torque delivery of the V8 engines. On conventional turbo engines, a wastegate is used in association with a turbocharger to control the high rotation speeds of the system. It is a control device that allows excess exhaust gas to by-pass the turbine and match the power produced by the turbine to that needed by the compressor to supply the air required by the engine. On the Renault Energy F1, the turbo rotation speed is primarily controlled by the MGU-H (see below) however a wastegate is needed to keep full control in any circumstance (quick transient or MGU-H deactivation). The wastegate is linked to the turbocharger but the auxiliaries occupy very little space. The challenge is therefore to make it robust enough to withstand the enormous pressures while small enough to fit. On a plane there are certain parts that are classified as critical if they fail. By this measure the wastegate is the same: if it fails the consequences will be very serious. The MGU-K is connected to the crankshaft of the internal combustion engine. Under braking, the MGU-K operates as a generator, recovering some of the kinetic energy dissipated during braking. It converts this into electricity that can be deployed throughout the lap (limited to 120 kW or 160bhp by the rules). Under acceleration, the MGU-K is powered from the Energy Store and/or from the MGU-H and acts as a motor to propel the car. Whilst in 2013 a failure of KERS would cost about 0.3s per lap at about half the races, the consequences of a MGU-K failure in 2014 would be far more serious, leaving the car propelled only by the internal combustion engine and effectively uncompetitive. Thermal behaviour is a massive issue as the MGU-K will generate three times as much heat as the V8 KERS unit. The MGU-H produces alternating current, but the battery is continuous current so a highly complex convertor is needed. Very high rotational speeds are a challenge as the MGU-H is coupled to a turbocharger spinning at speeds of up to 100,000rpm. Heat and Kinetic Energy recovered can be consumed immediately if required, or used to charge the Energy Store, or battery. The stored energy can be used to propel the car with the MGU-K or to accelerate the turbocharger with the MGU-H. Compared to 2013 KERS, the ERS of the 2014 power unit will have twice the power (120 kW vs. 60 kW) and the energy contributing to performance is ten times greater. The battery has a minimum weight of 20kg to power a motor that produces 120kW. Each 1kg feeds 6kw (a huge power to weight ratio), which will produce large electromagnetic forces. The electromagnetic forces can impact the accuracy of sensors, which are particularly sensitive. Balancing the forces is like trying to carry a house of cards in a storm – a delicate and risky operation. The intercooler is used to cool the engine intake air after it has been compressed by the turbocharger. 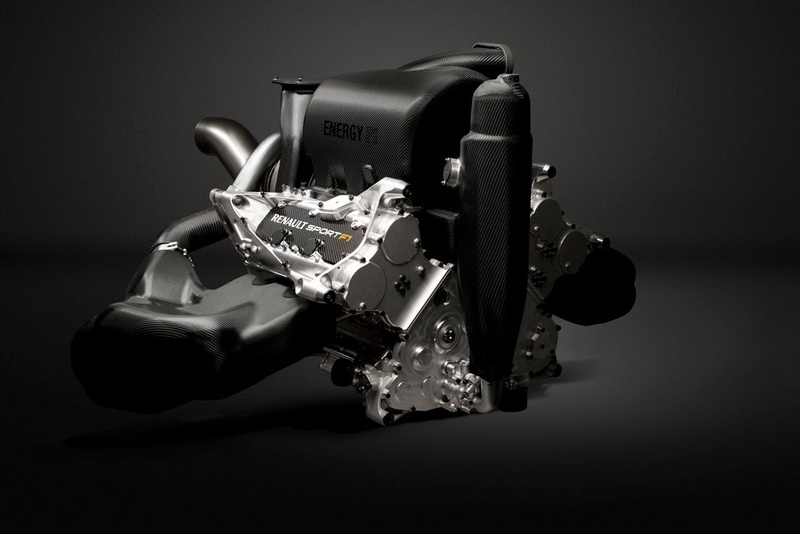 The 2014 Power Unit generates huge temperatures so the cooling requirements are far greater than those of the V8. Integration of the intercooler and other radiators is key but effective cooling without incorporating giant radiators is a major challenge and key performance factor. In 2014, the fuel quantity for the race is limited to 100 kg and the fuel flow rate limited to 100 kg/hr. 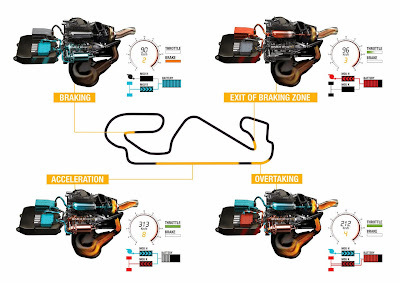 If the conditions and percentage of wide open throttle are such that the driver demands maximum power for more than one hour, there is clearly not enough fuel to make it to the end of the race. However, since the car will be propelled by both fuel and electricity, the balance between the two will become a key success factor, with the goal to maximise speed and minimise lap time. Under acceleration (eg. down the pit straight) the internal combustion engine will be using its reserve of fuel. The turbocharger will be rotating at maximum speed (100,000rpm). The MGU-H will act as a generator and recover energy from the heat and energy lost in the exhaust and pass to the MGU-K (or the battery in case it needs recharging). The MGU-K, which is connected to the crankshaft of the ICE, will act as a motor and deliver additional power to pull harder or save fuel, should the control electronics be so configured. At the end of the straight, the driver lifts off for braking for a corner. At this point the MGU-K converts to a generator and recovers energy dissipated in the braking event, which will be stored in the battery. 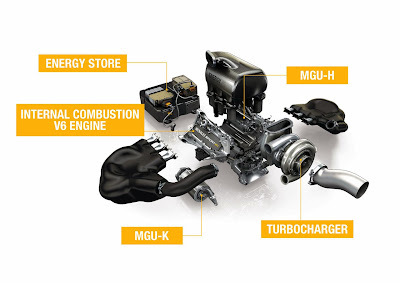 Under braking the MGU-H converts to a motor to keep the rotational speed of the turbocharger high enough to avoid the curse of the turbo engine – turbo lag. This is a phenomenon experienced under braking when the turbocharger speed slows as a lower volume of gas is produced. When the driver accelerates and more gas is produced, the turbo can take time to return to full rotational speed. To prevent this lag, the MGU-H turns to a motor and powers the turbo, keeping the rotational speed as close to optimum. When the driver exits the corner and gets back on the throttle, the MGU-H returns to a generator and picks up the energy from the active turbocharger and exhaust gases. The energy recovered can either power the MGU-K to keep the fuel burn as low as possible or charge the battery. Over the course of the lap, this balance between energy harvesting, energy deployment and (carbon) fuel burn will be carefully monitored. 'The use of the two types of energy needs an intelligent management,' Technical Director for new generation Power Units, Naoki Tokunaga, explains. 'Electrical energy management will be just as important as fuel management. The energy management system ostensibly decides when and how much fuel to take out of the tank and when and how much energy to take out or put back in to the battery. 'As a result, there will be a complex exchange of energy going on between the components in the system network, at varying levels of power over a lap. This is completely invisible to the driver as it is all controlled electronically by the control systems. The driver will be able to feel it but no driver intervention is normally required, so they can concentrate on the race in hand. The fact that the driver does not control the balance between fuel and energy does not lessen the involvement of the driver in any way, and in fact his job will be more complicated than in previous seasons. He will still be fighting the car to keep it under control during hard braking, managing braking to avoid understeer into a corner, applying delicate control over the throttle pedal mid-corner, sweeping through complex corners, throwing the car into high speed corners. In terms of driving style, there may well need to be some adjustments. Race strategy and race management will also be more flexible than in the past and the optimum solution will vary vastly from circuit to circuit, dependent on factors including percentage of wide open throttle, cornering speeds and the aerodynamic configuration of the car. 'In essence, engine manufacturers used to compete on reaching record levels of power, but now will compete in the intelligence of energy management,' Tokunaga surmises. In 2014, the fastest car on a Saturday will still start on pole since the sessions will be run 'flat out'. The cars will still be limited by the fundamental fuel flow restriction of 100 kg/h but the 100kg fuel limit will be irrelevant since very little fuel is burned over one lap. The driver will therefore be able to use 100% of the allowed fuel flow and the entire energy budget from the battery store for his qualifying lap. However, should he choose to use all the energy on one lap, he will not be able to complete two flat out timed laps and will instead have to wait until the store recharges. This will lead to some even tenser sessions and a number of different strategic calls. How different do you think the Power Unit will be between engine manufacturers? We have to imagine there is an optimum solution within the technical and sporting constraints and that different competitors will approach the optimum in different ways, at least in the beginning. Within each different PU project, the immaturity of the technology means that there could be rapidly changing performance, and as at the start of any radical new technical change, we expect progress will be extremely quick. The relative pace between competitors could therefore change more than we are accustomed to. But we should not underestimate just how competent the F1 teams are – the steps will be rough but large, and the convergence on an optimum solution will be rapid. Will we still retain the speed under the new regulations? The short answer is yes. What was an academic question in the beginning has become a lot more real from every point of view, but we have no need to worry. Obviously we are still in the virtual world and not on track but we have measured PU performance on the test bed and have matched the most optimistic predictions. 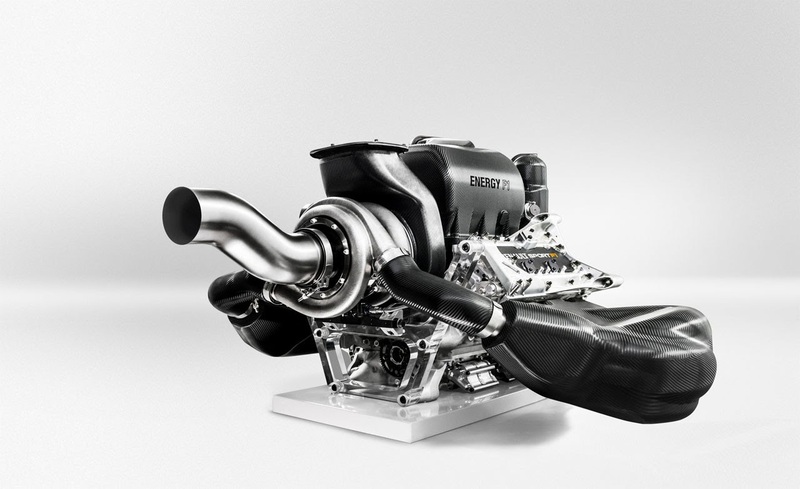 We believe that the Power Unit will deliver a lot of power and will be more than enough to make cars quick. The way that the cars will deliver this performance will be somewhat different this year due to the PU and aero regulations. The driving experience will be quite different, but we will absolutely see real speed out on track. And there will still be racing in 2014? This year there will be a lot of factors that drive unpredictable outcomes and from most people's standpoint, unpredictable results are good in a sporting event. We need to keep hold of some of the fundamental elements; there will be 22 cars on the grid and when the lights go out the guy that gets to the flag first is the winner. In between there will be a battle for positions on track, meaning there will be real racing. The way in which the races are managed by the teams is one of the big differences between 2013 and 2014. It is fair to say there are several different ways to skin a cat and this will produce different scenarios as we explore different possibilities about how to manage energy and power. Although the tool kit that we have is different, the fundamentals of the races remain very similar. Ultimately it is for the drivers to go for the opportunities presented to them. Will drivers have to change their style to the new regulations? The drivers are astonishingly skilled to detect the limit of the performance envelope of a car and adapt their driving to reach the limits. In the past, drivers have always been adept at adapting to different systems, such as the F-duct, KERS and so on, without too much issue: it's always remarkable to observe just how very close they can get to the theoretical limits. I do not think there will be a discussion of whether drivers are 'intelligent' or not – it is about being adaptable, just as they were with any other change. 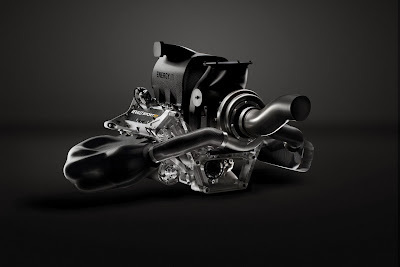 How has Renault Sport F1 had to adapt to the challenge of the new Power Unit? It is fair to say that we have had to strengthen the organisation and refresh the infrastructure at Viry to adapt to the very new environment of the Power Unit. We have recruited additional staff, some seconded from our parent company to complement the skills and experience of the existing Viry team. Additionally we have had support from Renault specialists and dedicated resources off-site, such as the materials laboratory. At the factory there have been upgrades to existing facilities and investment in new facilities adapted to the development of the Power Unit and its sub-systems including direct injection, turbocharging and electrical content. In parallel we have created new facilities at Mecachrome including a new dyno where the full PU will be signed off before delivery to the track. 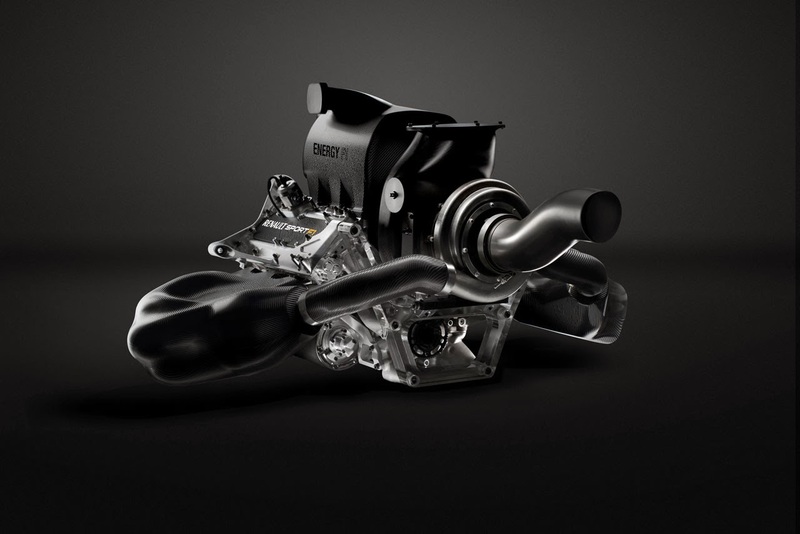 How will preparations for a race change with the new Power Unit? With the new Power Unit incorporating complex electrical and energy recovery systems alongside the standard internal combustion engine the workload pre-race will approximately double. As usual the chassis teams will send us the basic set-up information for each race about two weeks before the event. The engine engineer for the team will then combine this with Power Unit data in realistic conditions to simulate the general operating parameters of the car at that particular circuit. This will then be returned to the chassis teams for analysis with downforce and grip levels and other more advanced and detailed set-ups. This process is iterative and there will be several cycles of returns before we arrive at a set-up we intend to use at the track. As we learn more about operations this process will surely be refined, but we expect the man hours spent per team per race will run into hundreds – more than twice the preparation time for the V8s. Will anything change on operations during a race weekend? We have created an operations room to follow running in real time, which is a significant evolution over previous years when all data collection was monitored solely at the track. Additionally we will have greater support from the factory to analyse data post-sessions as we will repatriate information from the track to the factory more often. This quantity of analysis means we will use the dynos at Viry more often for 'live' simulations to optimise track performance. It's hard to say exactly, but I expect the dynos will be working up to three times more as there are more parameters to explore. With the V8 we could predict how it would go, and when there was an issue it was much more of a known issue. These units are vastly more complicated. In fact the only thing that is simpler this year is that there are no gear ratio changes as they are frozen at the start of the season. We can change once during the year but otherwise the eight gears are submitted to the FIA pre-season and they must be the same at each race. 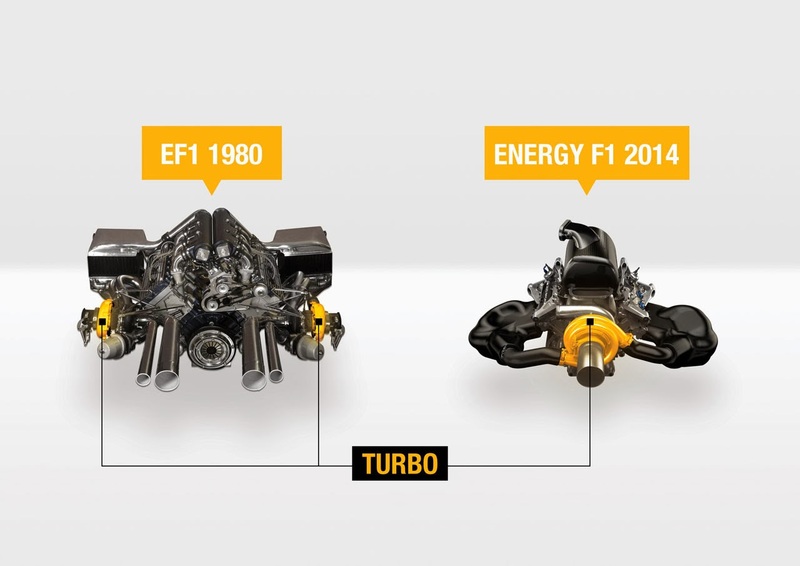 How will the engine support teams be structured this year with the new Power Unit? The new Power Unit comes with a very different set of challenges so we have strengthened the engine support team operating trackside. For each partner we will have a team of eight technical staff, with one engineer per car, one mechanic, and then one electrician plus a performance engineer, who will look after energy management and the set-up of the Power Unit relating to the balance between fuel and electricity. He will work in close collaboration with the chassis teams, particularly the strategists and the race engineers. Will the modus operandi at the tracks change between Renault and the chassis teams? Not fundamentally as we are already very well integrated with the chassis teams trackside. However the flow and the amount of information between the two halves will be much larger and more important than in previous years. The Power Unit will have two types of energy next year and the way we use them will have a much greater effect on the strategy and its deployment. With the V8 we decided on a strategy and knew at the end of the race we would be within 1% of the optimum. Next year we could have a delta of many tens of seconds if we get things wrong. Will we be hearing different calls on the radio next year as a result? We will hear different calls, for sure. We won't call out to change the fuel mixture, instead referencing fuel budget, or the quantity of fuel used per lap. Prior to the race the engineers will decide on the mix between fuel and electricity over one lap and we will have a target – or fuel 'budget' we will need to monitor to ensure we get to the end of the race. The engine engineers will monitor the rate of fuel consumption (both carbon and electric) and the driver will be told over the radio if he is over or under the fuel delta. He will have to manually adjust or alter the style to take this into account. From 2014 there are just five Power Units per driver per season, but the different components (turbo, ERS etc.) can be changed independently of each other. How will you manage this system? In an ideal world we will try to do as per last year, that is, we change everything together. The life of each part is designed to be roughly similar so we will try to keep the system as a whole, so changing the turbocharger, ERS and battery at same time. However there is also a system where you can change different elements if you need to. While we would not necessarily seek to run different life combinations, it does enable us to tailor the Power Unit to the specificities of each circuit should we need to. For example, we could run a new internal combustion engine at Monza with an old battery to get more power, or we could use a new battery at Monaco and an old engine as the sensitivity to electrical power will be higher and the need for outright speed a lot less. Keeping pace with it all seems difficult but I do not expect we will see too many people using the modular system in real life. Will any of the tracks pose any particular difficulties? In essence no more than in previous years. Monza will still remain the hardest on the ICE and high speed, while Monaco and Budapest will be critical for energy recovery. However what we will see is that the turbo will serve as an equaliser between ambient and atmospheric conditions so circuits that were not considered 'difficult' may have to be reassessed. For example, in the past we always said that Brazil was relatively low impact as we could use engine on the third race of its life due to the low atmospheric pressure that placed less stress on the internals. However since the turbo greatly increases ambient pressure inside the engine, the internal stresses are always the same and the amount of oxygen in the air becomes largely irrelevant. Similarly, in Malaysia we could always count on the humidity to limit the effect of the long straights but now there will be no power loss due to the lack of oxygen in air as we are mastering the quantity of air in the engine at all times. Do you expect the turbo to take longer to warm up at the high altitude races as we saw in the past? A lot of people remember when it used to take hours to start and warm the engines at places like Brazil and South Africa, but this time round I think we will be fine as technology has moved on a huge amount. Ultimately it's the performance on track that counts anyway! What are the main challenges of the unit for the engine teams trackside? First of all it will be how to dissipate the heat. The turbo and the electrical motors generate huge temperatures but the internal components will be running very hot too. Of course making everything work together – without interference – is a major challenge. The electromagnetic forces will be very high so managing all the systems simultaneously will be somewhat stressful! 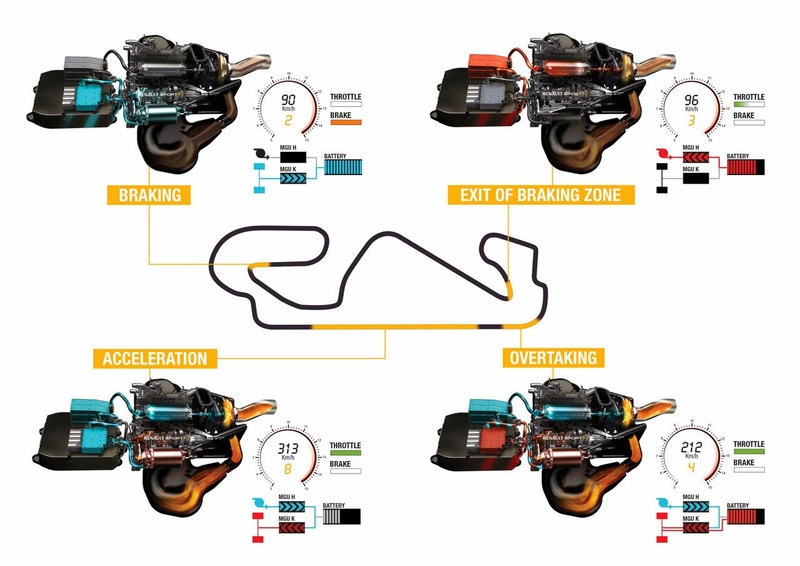 Quick guide: Power Unit management and what can be changed between races Unless he drives for more than one team, each driver may use no more than five Power Units during a Championship season. If a sixth complete Power Unit is used the driver concerned must start the race from the pit lane. Each driver can use five of each of the above components during a Championship season and any combination of them may be fitted to a car at any one time. The first time a driver uses a sixth of the above six elements a 10-place grid place penalty will be imposed at the next race. This then starts a new cycle so if another (different) part is used for a sixth time, he will receive a 5-place grid penalty. If a driver wants to use a seventh of the six elements, he starts yet another cycle so he will get a further 10 place penalty. The second time he wants to use a seventh part he will get a 5-place grid penalty. If a grid place penalty is imposed, and the driver's grid position is such that the full penalty cannot be applied, the remainder of the penalty will be applied at the driver's next race. However, no such remaining penalties will be carried forward for more than one GP.